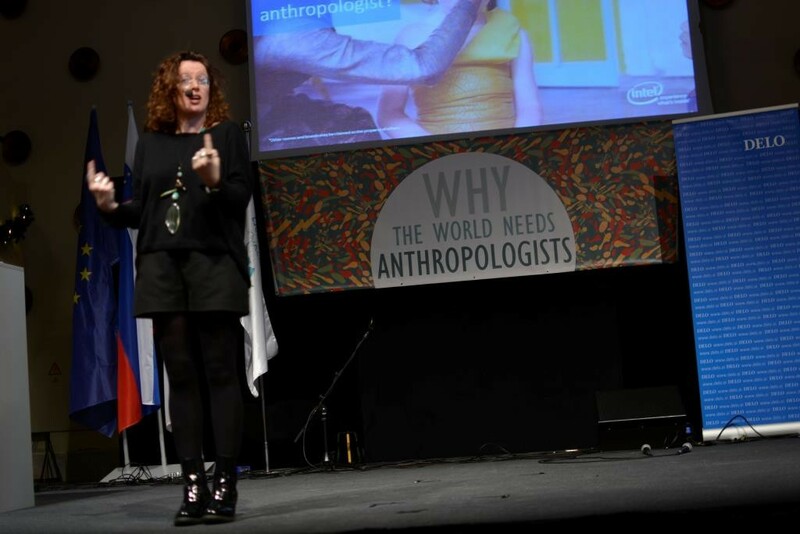 On Friday, 27 November 2015, Ljubljana (Slovenia) hosted the third international symposium ‘Why the world needs anthropologists‘. The theme of this year’s event was ‘Burning issues of our hot planet’. The main purpose of the symposium, which was attended by 450 participants from 25 countries, was the integration of anthropological knowledge and skills with other scientific areas, and particularly with climatology, as well as the IT and non-governmental sectors. The event attracted established academics, recent graduates, students, as well as members of the general public. Experts – including Lučka Kajfež Bogataj, climatologist of the University of Ljubljana and a member of the Nobel award-winning Intergovernmental Panel on Climate Change, Intel Fellow and user experience director Genevieve Bell (pictured), Professor Thomas Hylland Eriksen of the University of Oslo, Joana Breidenbach, founder of Germany’s largest donation platform betterplace.org, and Lenora Bohren, environmental anthropologist and director of the National Center for Vehicle Emissions Control and Safety (NCVECS) at Colorado State University – shared their views on resolving the vital issues our society is facing. Watch video of the entire event.